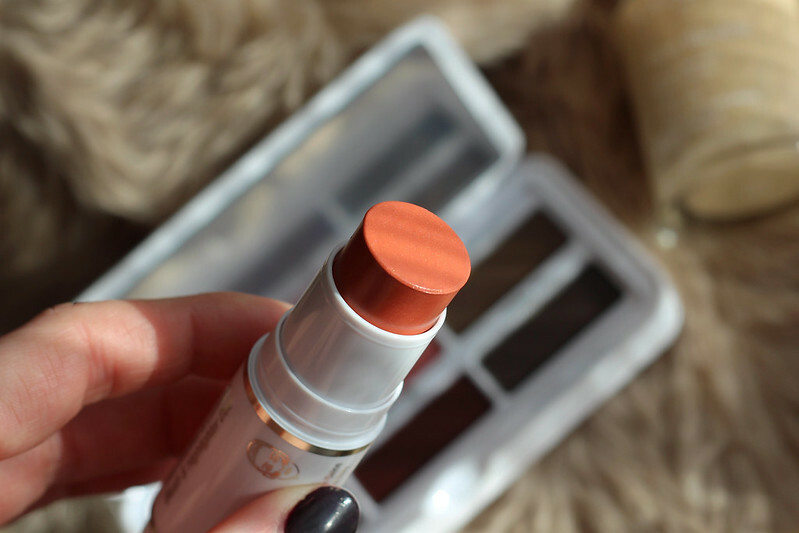 Last month I went along to a Clarins event for the launch of their new Spring Collection. 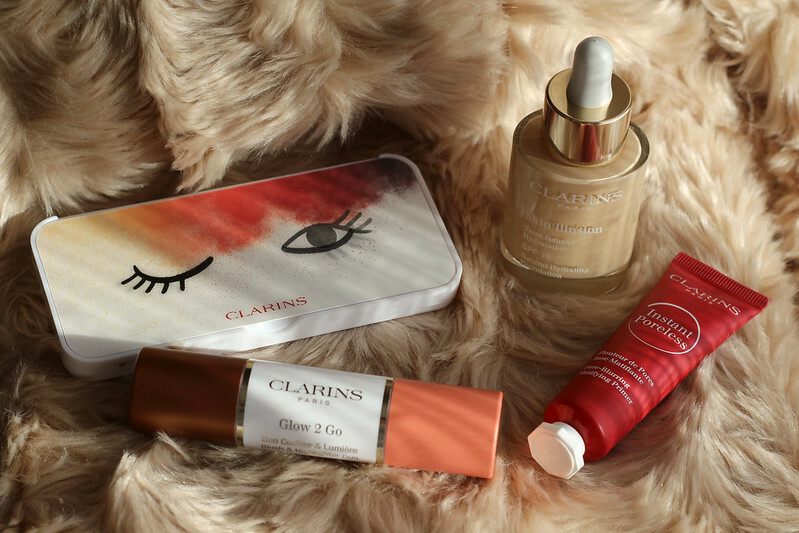 I'm a big fan of their skincare but having not tried any makeup from Clarins in a long time, I was very excited to see the collection. 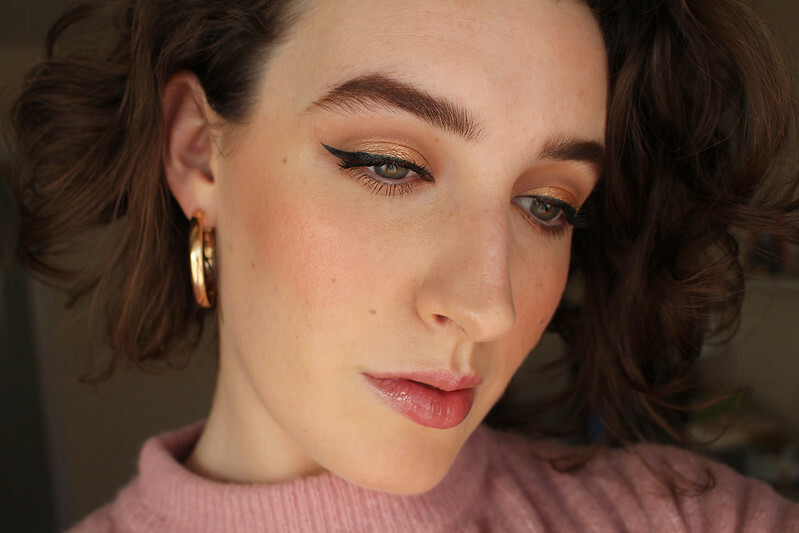 I love their mascaras, the Instant Concealer and Instant Light Lip Perfectors and the Lip Oils but other than that I haven't tried a lot from their makeup range. We received press samples of the collection which included the Ready in a Flash Eyes & Brows Palette (€39), the Instant Poreless Pore-Blurring Matifying Primer (€27) and the Glow 2 Go Blush and Highlighter duo (€29). We were also colour matched to the Skin Illusion Foundation (€34) which although not part of the collection, was the perfect accompaniment as it is supposed to be a natural, hydrating foundation with light coverage, perfect for Spring. 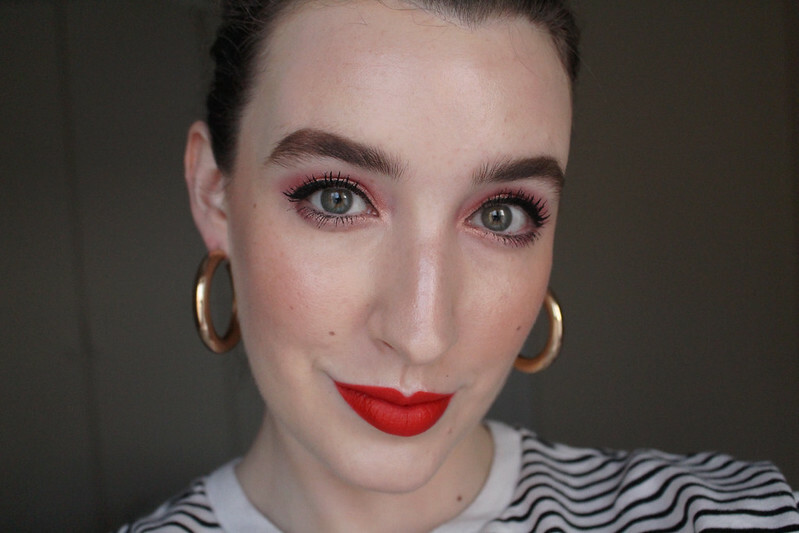 I was particularly excited to try the foundation as I've never tried a Clarins foundation before. I'll start with the foundation because it's the first thing I tried. As far as I know, this incarnation of Skin Illusion was released last year as a reformulation of the previous Skin Illusion foundation. 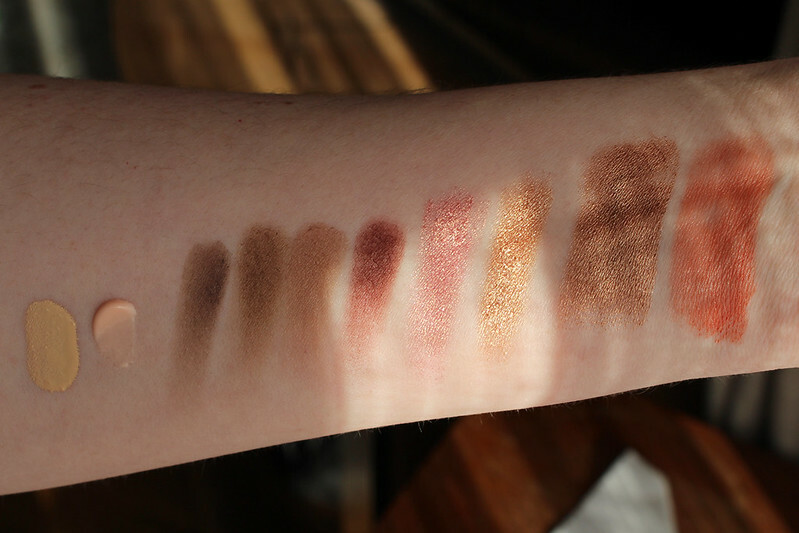 There are only 22 shades of the foundation and sadly very few darker shades which automatically means a lot of people won't be able to wear it. Here's hoping brands will continue to add both darker and lighter shades to their foundations in order to be more inclusive of all skin tones. I was matched to Shade 101, Linen which is a fair shade with warm undertones and it definitely looked a lot more yellow than I'm used to when I first applied it. I would probably have gone for the shade Porcelain if I had chosen myself. However because it's such light coverage once I had blended it out it was perfectly fine. It took me a few applications before I managed to be completely happy with the foundation. The first time I tried it I think I used too much and found it sat on my skin, the second time it really emphasised any dry skin on my face which rarely happens to me, but I was testing it out when I was sick and blowing my nose a lot so I waited until I was better and made sure my skin was exfoliated and hydrated and by the third or fourth time I was so impressed with how it made my skin look. The claims for Skin Illusion make it sound like an almost perfect foundation for me. It's meant to give a bare skin effect, hydrating, natural radiance, serum texture, anti-pollution complex and has Clarins plant-based oil expertise. It also has SPF 15 but to be completely honest, for me anything less than SPF 30 is pointless so I would use a separate SPF under this if I knew I was going to be outside. It has a glass bottle with a dropper which let's be honest, isn't most peoples preferred foundation packaging however I know it has to have that packaging because it's a more liquid formula. If I was travelling with this I'd probably decant it into a small plastic pot to make it more travel friendly. I also found that a little goes a long way. My advice is to try a few drops and then build it up if you need to. The formula makes it very easy to blend and straight away my skin was noticeably radiant. Hopefully you can see that in the photos below. Some of the plant ingredients include a type of seaweed called Jania that helps to eliminate dead skin cells and promotes a clear complexion (it also is known to moisturise, protect and hydrate the skin). It also contains an ingredient called Kalanchoe Pinnata, known as the Leaf of Life or Miracle Leaf which is used medicinally for many different purposes and in skincare it helps the synthesis of hyaluronic acid which boosts hydration. I found it best applied with a complexion sponge at first but then I tried it again with a brush and that worked just as well. You could also apply with your fingers as it's such a light texture. 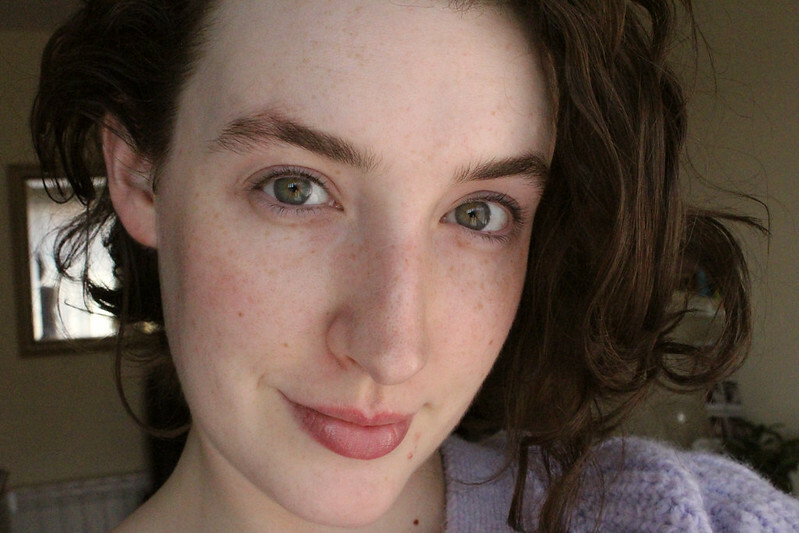 After a rocky start which can most likely be attributed to my skin acting up, I'm so impressed with how my skin looks with this foundation. I also spritzed the new My Clarins RE-FRESH Hydrating Beauty Mist on before applying it and it worked really well to make blending it even easier. It gave my skin such a glow but didn't cover too much, it just looked like I had amazing, even toned and radiant skin. It also lasts on me surprisingly well for a hydrating foundation. I love that it's not just a foundation, Clarins have done their research and added ingredients that treat the skin as you're wearing it which as I'm getting older is an essential for me in a foundation. At €34 for a 30ml bottle, I think it's quite reasonable in comparison to more expensive foundations. The light coverage won't be for everyone, but I love it and I can see myself wearing it a lot in the Summer. Next up is the Ready in a Flash Eyes & Brow palette which I was very excited to try. It has the cutest packaging that's supposed to look like a smart phone, it's plastic and compact and therefore great for travelling or popping in your bag if you like to take makeup out with you. 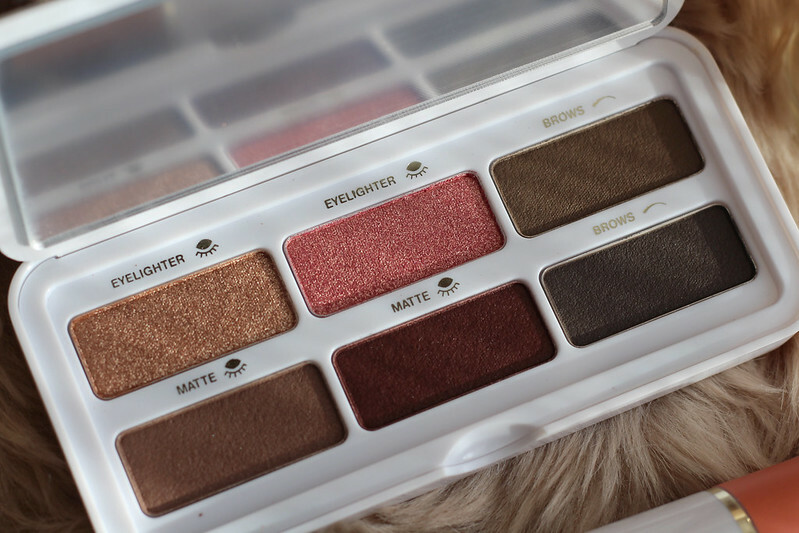 It contains 4 matte shades, 2 of which are meant for brows but can be used as matte eyeshadows either. It also has two 'Eyelighter' shades, a beautiful metallic gold and rose gold which can be used dry or with a damp brush for more intensity. 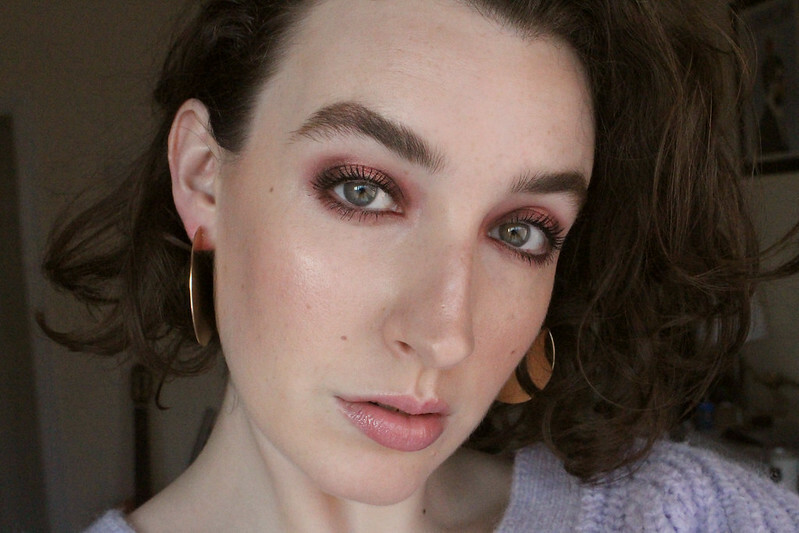 They pair perfectly with the matte shades underneath and I was really surprised by how versatile the palette is considering there aren't that many shades in it. You can see below three of the looks I created using the palette. The standout shade for me is the rose gold. It's just such a stunning shade worn alone or as you can see used in a halo eye look. 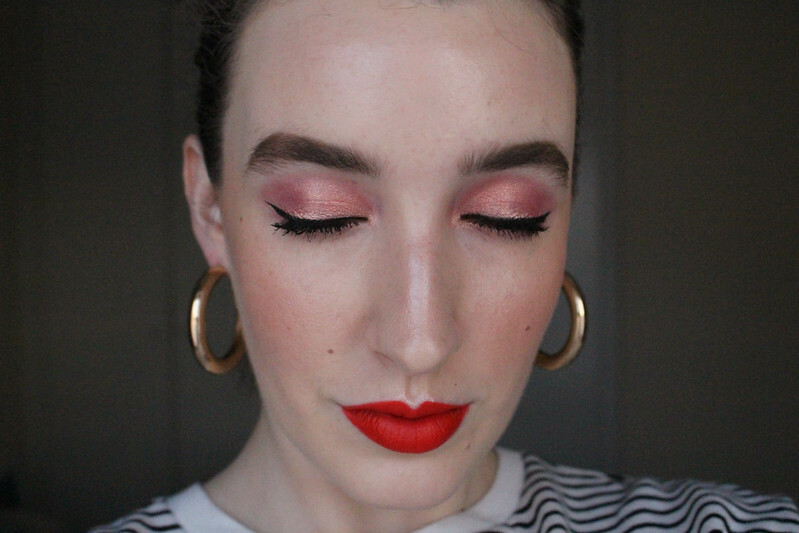 I tried the brow powders and they worked best for me mixed together. Although I'm not a huge fan of the heavy brow look, I'd definitely use these if I was going out or as I said they work well as eyeshadows too. It's been a long time since I've tried Clarins eyeshadows but I'm really blown away by this little palette, it's playful but with quality, versatile eyeshadows. Probably my favourite product from the collection. 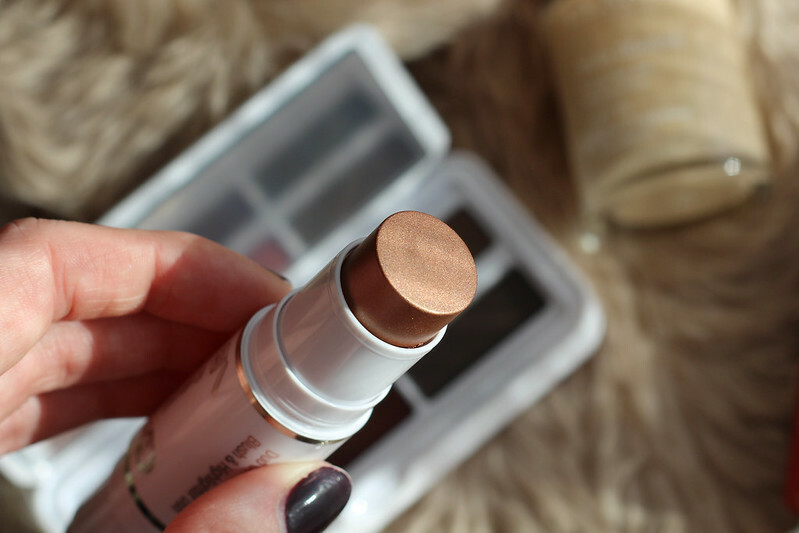 The Glow 2 Go Blush and Highlighter Duo sticks come in two different colour ways. I was given the shade Golden Peach which as you can see has one side thats a shimmery bronze shade and the other is a shimmery golden peach. The other one, Glowy Pink has one pink side and the other is a silver/holographic highlighter. 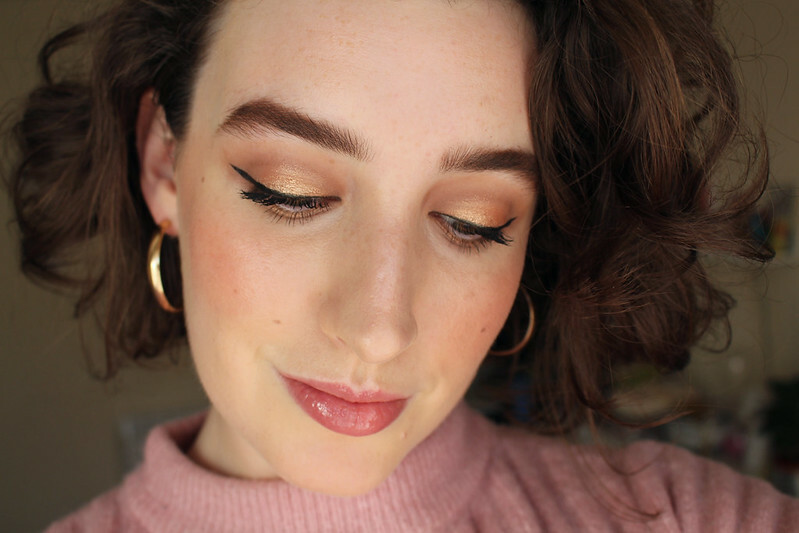 When I first opened Golden Peach my first thought was that it probably wouldn't work on my skin tone however I gave it a chance and I was so surprised how much I love it. I've been wearing it a lot since I got it and I found it so handy for bringing with me when I was away for a night recently. I think the fact that it's a cream product makes it more forgiving. I rarely use bronzer but I applied the bronze side as I would any bronzer, on any areas of the face that would naturally tan (if I actually got a tan), across my cheeks and nose, a little on my chin and my forehead. I then applied the peach side on the apples of my cheeks as I would any blush and then blend it all using my foundation brush. I loved the sun kissed glow it gave my skin. It looked so healthy and although there's shimmer in both sides, it's not too overpowering. You can apply it directly on your skin or use your fingertips to warm it up and then pat it on and blend with your fingers for a faster application. I really want to get the pink one now as I'm intrigued by the silver side and because I love easy to use cream products like this, I think I'd get a lot of use out of it. 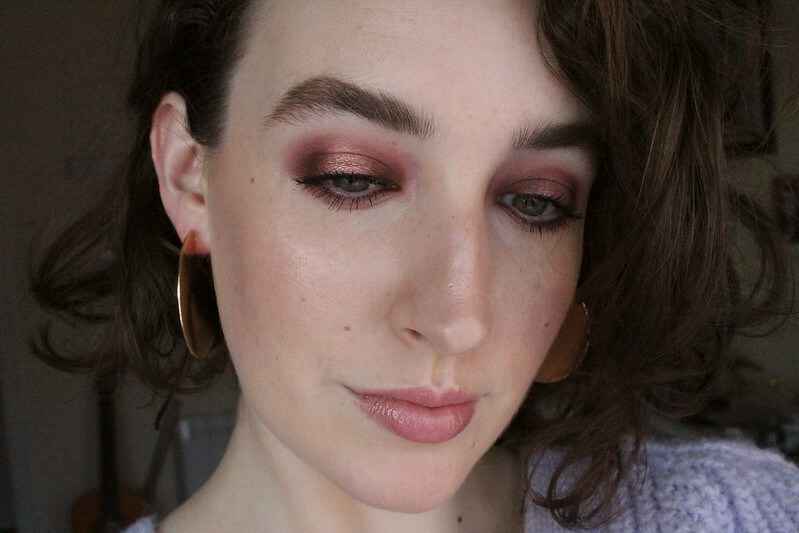 At €29 they aren't cheap but you're getting two products in one and you can also use them on your eyelids as a quick wash of colour or as an eyeshadow base. Golden Peach would work really well on darker skin tones too, particularly the bronze side which would be a gorgeous highlighter. Lastly is the Instant Poreless Pore-Blurring Matifying Primer. I found this a strange addition to a Spring collection but it's meant to almost be like a blurring filter for your skin in real life. It claims to mattify skin, minimise pores, improve makeup hold, give a blurring effect while still being breathable. If you've ever tried the famous Instant Smooth Perfecting Touch primer, it's like a lighter version of that. It doesn't have that heavy silicone feeling that a pot of pore minimising primers have, but rather feels quite lightweight. Obviously this is only going to be suitable for people with oily skin or if you have combination skin like me, I use it only on my t-zone to get a bit more wear time before I start to look oily there. As it's only a 20ml size tube I think that's the best way to use this primer as most people wouldn't need to use it all over their face. It definitely doesn't fill in your lines and pores the way other primers can but I prefer that as I like my skin to look like skin and not like I've edited it and blurred out all the texture. One of the main plant ingredients is Arbutus (Strawberry Tree) which is actually found in Ireland and helps to absorb excess sebum. I don't generally use primers most days but I find matifying primers handy to have in my collection for days when I really want my makeup to last from early to late. That being said I probably wouldn't buy this again because I wouldn't use it enough for me to spend the money on it. If you have oily skin I highly recommend checking this out in person. Wearing Instant Primer, Skin Illusion, Glow 2 Go and the two left shades in the Ready in a Flash palette. 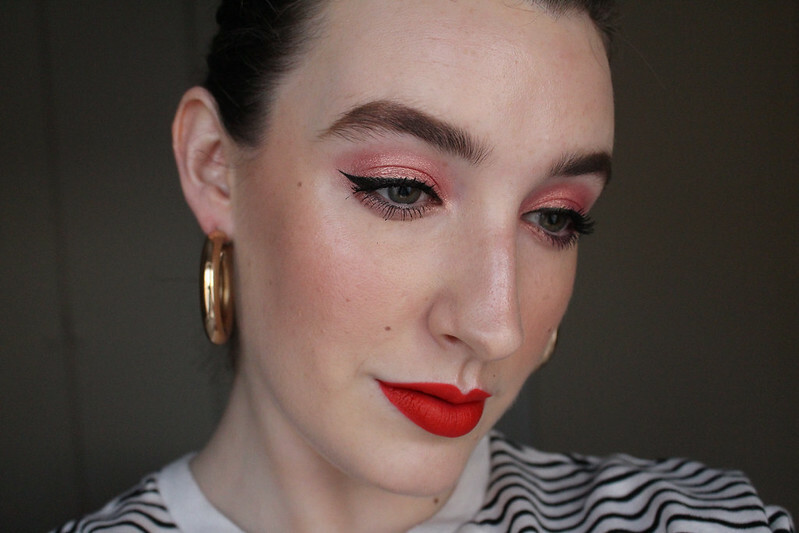 Also wearing Fenty Beauty Gloss Bomb, IT Cosmetics Superhero Mascara, Brow Power and Soap and Glory Supercat Eyeliner and Charlotte Tilbury Hollywood Flawless Filter. 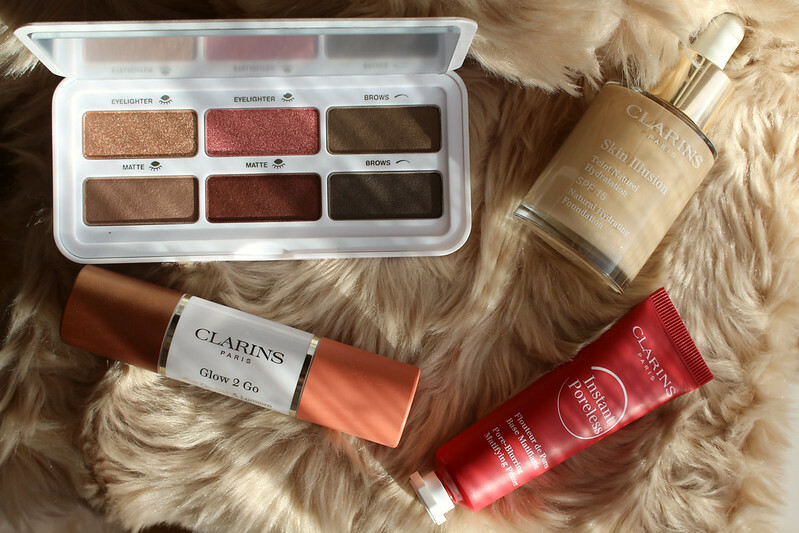 Having tried out the collection for about a month now, I have to admit I'm so impressed with Clarins makeup. I think they've stepped up their game and have made everything quite modern and youthful but with excellent ingredients and quality products that actually do what they say they're going to. I found this collection a lot less gimmicky than so many other Spring collections from other brands. 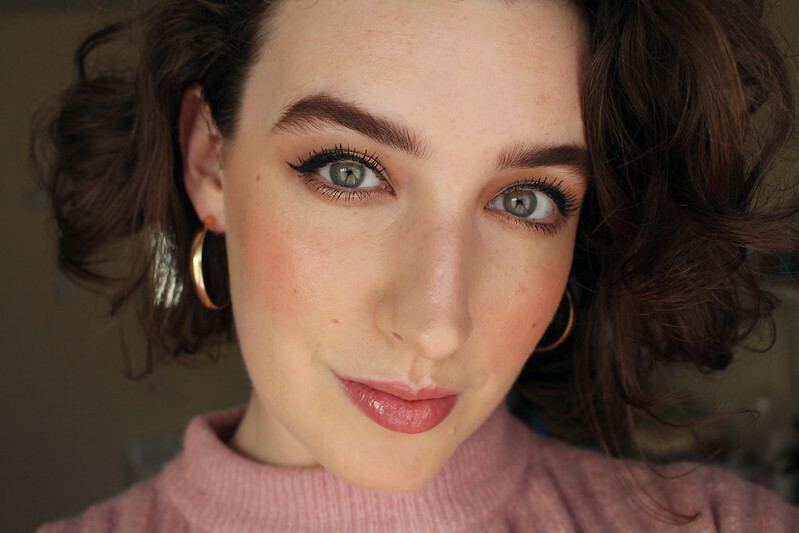 These are products you would actually use and work really well to create an edited makeup collection that has multipurpose products that are easy to use and give your skin a fresh, radiant look. This collection in addition to the new My Clarins range demonstrate a brand that are becoming more environmentally and ethically aware and hopefully more inclusive. What do you think of the collection? Is there anything that takes your fancy?